Lippo Malls Indonesia Retail Trust recorded a return of 18.1%. 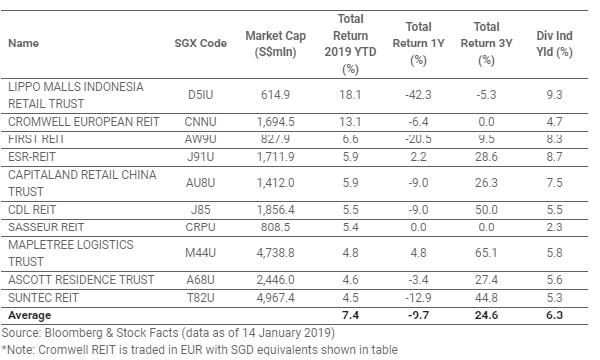 This chart from the Singapore Exchange (SGX) shows that S-REITs extended their gains in early 2019, with Lippo Malls Indonesia Retail Trust sealing the highest return of 18.1% in 2019 YTD.Rounding up the top five are First REIT (+6.6%), ESR-REIT (+5.9%), and CapitaLand Retail China Trust (+5.9%). Together, the five stocks with a combined market capitalisation of more than $6b have averaged a total return of +9.9% in the YTD, bringing their one-year and three-year total returns to -15.2% and +11.8% respectively. “Analysts had noted revived investor interest in S-REITs in the final quarter of last year, driven by a flight to safety amidst rising risk-aversion, as US-Sino trade tensions continued to simmer, and global equity markets remained volatile,” SGX commented. 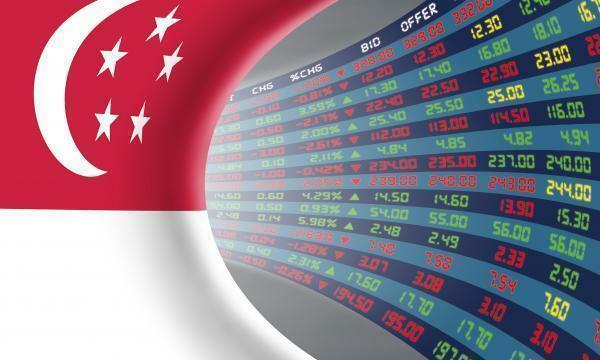 Amidst a challenging market environment, Singapore REITs were amongst the best-performing sectors on SGX in the months of November and December 2018, registering total returns of 2.3% and 0.3% respectively, SGX noted. Most of those gains appear to have been extended in the first two weeks of 2019.